These were as delicious as they look. You know how I said these were going to be put into the freezer for Fill It Up Friday? Well, um…none made it to the freezer. They were that good. I made these before supper one night and they ended up being dessert. After saving a couple blueberry cinnamon roll muffins from certain after dinner consumption, they were eaten up the next day for breakfast. Oh, well. I am going to make some for the freezer. I think these would be great for those busy, getting ready for school mornings. This wonderful recipe didn’t come from me, it came from Port & Finn. Of course, true to Baking With Mom, I may have tweaked the recipe slightly. I also added a lot more cinnamon. The above statement stands true with this one as well. The original recipe calls for buttermilk. I used regular milk. I almost always do. One of these days, I need a side by side comparison between something with buttermilk and something with regular milk. Is there that great a difference? 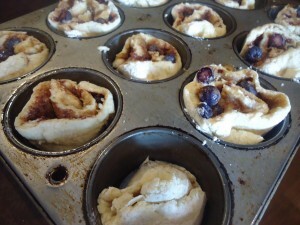 You can find the recipe here for Blueberry Cinnamon Roll Muffins. It will become a fast favorite. Just make a double batch if you want to freeze some. Trust me.